My pink roses have lots of leaves, coming, and buds for later. But there are just two flowers on minature Lavender Jade. I choose to mix my roses with lots of other plants. Indigenous/native as a first choice. I use blue/glaucous foliage to set off the variety of pink shades. Any colour, so long as it is pink. The planting plan? A variegated Tulbaghia adds some vitality. From plantZafrica This drought resistant plant stretches from the Eastern Cape, KwaZulu-Natal and Limpopo, to as far north as Zimbabwe. 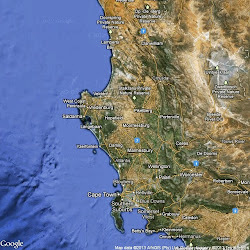 Tulbaghia is named after Ryk Tulbagh (died 1771), governor of the Cape of Good Hope. 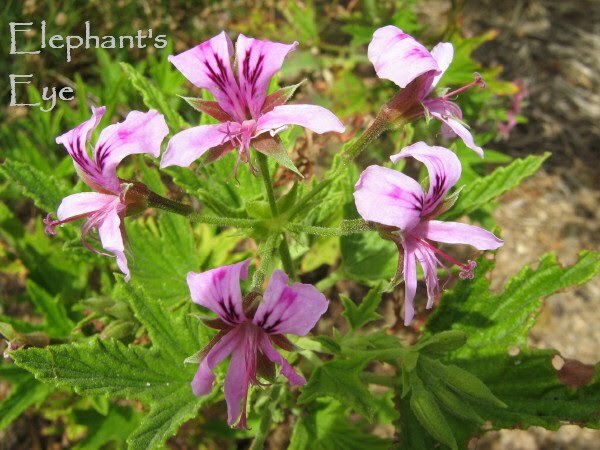 This attractive plant is ideal for the herb garden, as both the leaves and flowers can be used in salads and other dishes. The Zulus use the leaves and flowers as spinach and as a hot, peppery seasoning with meat and potatoes. And the blue fescue suprises me by producing matching blue flowers! The Dianthus (Greek for divine flower, flower of the gods) has delicate fronds of low foliage. Just one plant, which I am going to have to encourage to make a border. Dais cotonifolia is the focal parasol tree in this bed. Ideal in a small formal garden, instead of the usual standard or lollipop. Chosen both for its bluish leaves and its flowers. Its common name is pompom tree – for the balls of pink flowers. Planted in 2007, last year it made a disappointing handful of flowers. Now however, the first flowers are opening, and I can see masses of buds coming. Like our Agapanthus this flowers for a South African Christmas. For the first few summers, the young tree will need watering. But the promise of flowers compensates for the trudge of handwatering. According to plantZafrica Flowers are produced on the previous year's growth, so any pruning should be done after flowering. Breaking a branch off this tree is quite difficult because the bark tears off in long strips. This is a typical characteristic of the family Thymelaeaceae to which Dais belongs. 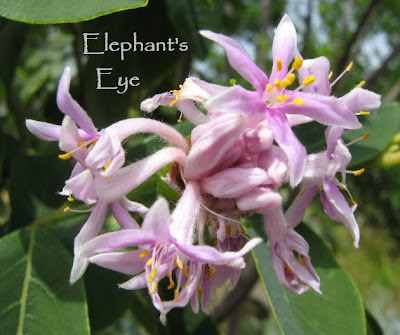 Eve Palmer notes in her description of Dais cotinifolia that the Africans, who use the bark as thread or cord, say that it has the strongest fibre of any tree in KwaZulu-Natal. She also mentions the interesting fact that Linnaeus founded the genus Dais in 1764. In this genus there are only 2 species, Dais cotinifolia from South Africa and one other species from Madagascar. Dais means a torch in Greek, and the genus got its name from the resemblance of the stalk and bracts holding the flowers to a torch about to be lit. My favourite pelargonium, divine citrus scented leaves, and fragile, delicately marked pink flowers. Grows happily from cuttings (from March, after the worst summer heat is past). Again from plantZafrica Pelargonium citronellum grows in a small area near the village of Ladismith in southeastern Western Cape. 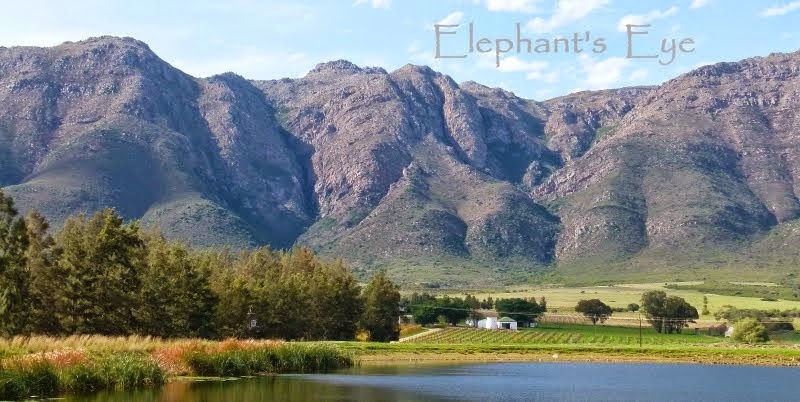 It is common on the northern foothills of Langeberg Mountains, from Miskraal to Herbertsdale. The seed is adapted to wind dispersal, it is light in weight and has a feathered, spiral, tail-like attachment. When the seed lands and there is sufficient water in the soil, the tail becomes like a drill, twisting the seed into the soil so that the seed can anchor itself in the ground and prevent itself from being blown away, or carried away on moving animals. Shimmering pink stars, with its own luminous lime to apple green foliage in the background. Chironia baccifera (carrying berries), common name Christmas berry, and part of the gentian family. Waterwise (but benefitting from the water for the roses!) groundcover. Distinctive foliage, pink flowers, followed by red berries like holly. I once bought a plant at the annual Kirstenbosch plant sale. Made a sad few flowers and died. The bonus of chipping, shredding and composting, is that plants you remember, but can no longer see, come back! They seed themselves from within the mulch. And I now have an exuberant Christmas berry, about to be covered with a veil of pink stars! Always more info at plantZafrica It occurs from Empangeni in KwaZulu-Natal, along the coastal belt south through Eastern Cape and Western Cape and as far north as Namaqualand in Northern Cape, from sea level up to altitudes of 1 450 m. It is usually found in dry, sandy soil or sand dunes, growing in the shade of other plants. It is named after Chiron, the good Centaur of Greek mythology who studied medicine and other arts. 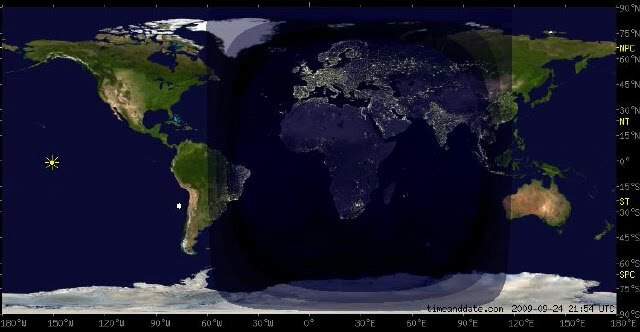 Legend has it that after he died, the god Zeus elevated him to the southern sky as alpha and beta Centauri, the two pointers of the Southern Cross. This is a African genus of approximately 30 species of which 16 are found in southern Africa. The Christmas berry has been used to treat several ailments in traditional South African medicine. 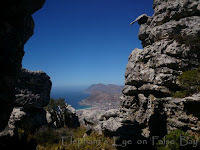 It was originally used by the Khoi and adopted by the early European settlers. Plants are at their best for 2 - 3 seasons, after which they need to be replaced. Plants can be grown from seed as well as cuttings. 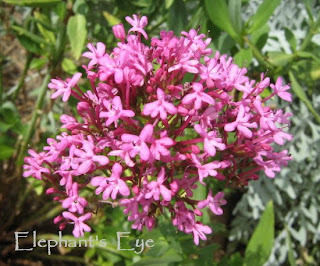 Brick red pink Valerian always makes me think of Cornwall, summer sun, and stone walls. It is perennial, but someone suggested treating it as an annual. That would avoid the straggly, straggling mess I have lurking below the exuberant flowers. This bed is in my Paradise/rose garden, so I will cover the roses later, using photos from my archives. Beautiful pinks to start a below-freezing day here in Virginia. 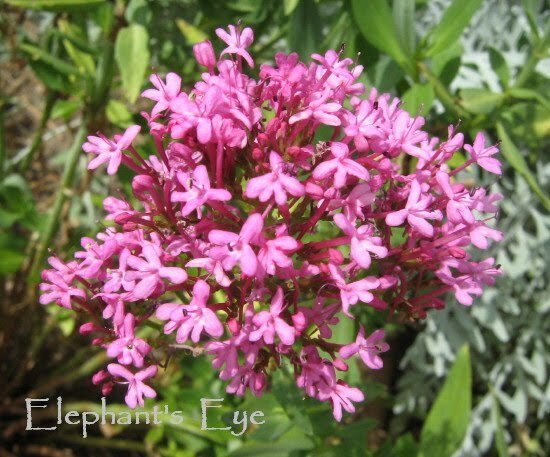 These are all such beauties...my fave is valerian..I just love everything about it..its cluster of mini-shapes...color..gorgeous! Wonderful post! Barbara - no, it is not you. Our Spring was in August, very brief. We are into summer. I needed a name for the pink rose bed - so I think of spring and apple blossom pink. I haven't tried using Pelargonium against bugs. Think you would have to rub leaves on you, or the furniture to release the oils tho. Tatyana - my roses have been to the same school as yours! Nice Diana~~ I love pink and the choices you have integrated with your roses are delightful! I look forward to seeing more. Lovely to see those bright summer flowers. I an surprised by the use of Tulbagia leaves in salads. 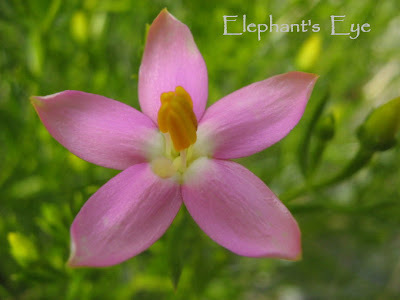 Easygardener - I admit I haven't tried the leaves, but the plantZafrica site is reliable. I love garlic chives, so why not try the Tulbahia? 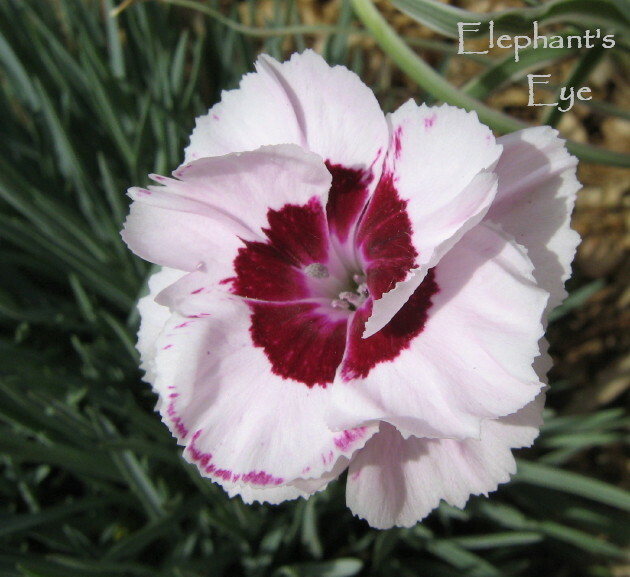 I love all of your pinks, especially the Dianthus. I am enjoying your spring while we are going through autumn. 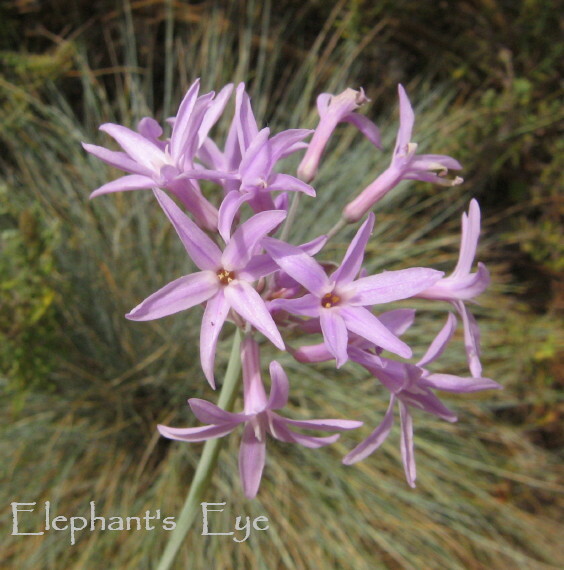 It was only this morning that I took some photos of my own Tulbaghia in bloom (it's also the variegated one) for a little blog entry of my own on this, one of the hardiest plants in my garden here in Sydney. And then I dropped by here and the first thing I see is yours. Pleasant surprise! Gail - I still wonder why USA gardeners call it Society Garlic. Why/what society?? Australian gardeners call it society garlic too (that's how it's sold here – you often don't see the word Tulbaghia mentioned on the label, which is just plain silly). Don't know why it's called society garlic, though. Waiting ... for Lunch OR Murder Most Foul!